This article is about the Ghostbusters figures from the mid 80's, and not the Ghostbusters everyone normally thinks of. First some background: We need to go back to the mid 1970's. in 1976 Filmation studios (best known for their animated cartoons of Masters of the universe and Fat Albert) had a live action show called Ghostbusters. In every episode the Ghostbusters agency (consisting of Spencer, Kong,and Tracey ,a gorilla who was smarter then both of the guys) would recieve their assignment to go to the same house and get rid of the pair of ghosts (like the ghosts of a cowboy and cowgirl, vikings, and a gypsy and her pet werewolf) who were haunting it for the week. Through a series of bad slapstick plots they eventually caught up to them and used the Ghostbuster's ghost dematerializer (a camera looking thing with bike handlebars on it) to send them back to the spirit world. This show lasted for 2 years. Now we go to the 80's when Dan Ackroyd and Harold Ramis came up with the script and film we all know as Ghostbusters. Filmation owned the rights to the name Ghostbusters since the 70's and sued. Despite this fact, the public considered the film and characters THE Ghostbusters so a compromise was made when it came time to do an animated show based upon the movie in 1985. The new cartoon would be retitled The Real Ghostbusters and would became a hit with children when it premiered on ABC television. This seemed okay with Filmation who felt that "two can play at that game." and instantly created a cartoon simply titled Filmation's Ghostbusters. This cartoon would follow the modern day exploits of Jake Kong and Eddie Spencer (the sons of the 2 humans from the live action show) and Tracey the gorilla (the only leftover from the origional live action show) as they busted the spooks lead by a bad ghost called Prime Evil (who was basically a Skeletor ripoff). Every episode the team used their dematerializer to send the bad spooks back to Prime Evil's spirit realm and foiled his plans to once again conquer the land of the living. Now we get to the toys. Schaper Toys (who would soon be bought out by Tyco) released a series of figures based upon the main characters from the Filmation cartoon, just as Kenner were releasing a series based upon the popular movie cartoon portrayals of Ray, Peter, Egon, and Winston. The Schaper figures had usually 5 points of articulation (head, arms and legs) except for baddies Prime Evil and Mysteria who had less due to the robes they wore. The likeness was pretty close to their animated appearance. Jake Kong, Tracey the gorilla, Eddie Spencer, Jessica (who helped out the boys from time to time), Futura (a female time traveler from the future hence the name), and a combination bat/pig creature called Bellfry were the good guys. Evil spooks were represented by Prime Evil, Mysteria (a Vampira like character who was sort of their version of Evil-Lynn of the He-Man line), Bratarat (a combination rat/bat/bagpipe creature), Fangster (a werewolf from the future), Haunter (who was dressed like he was out on safari), Scared Stiff (a robot-skeleton), and Fib face (who had 2 faces on his head). Also made were the Ghostbusters' vehicle - the Ghostbuggy, a headquarters playset for the team to play in; Futura's Time Hopper bike; and Prime Evil's Organ. I don't think I have to tell you which cartoon and figures became a hit and which were forgotten. 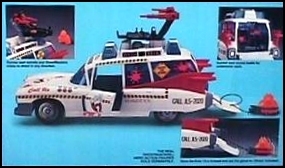 The Flimation cartoon and figures just couldn't compete with the more popular version of Ghostbusters who had a movie, theme song and cartoon under their belt. The line lasted 1 year and quietly dissapeared. The Filmation cartoon had gotten in sort of a rut and several characteristics were just like the He-man cartoon. The bad guy was a Skeletor ripoff, complete with imcompetent assistants, and there was a moral lesson at the end of every episode. Really nothing new or different to this cartoon at all. To many it was a pale imitation of the more popular Ghosbusters show whose team couldn't care less about delivering a moral lesson at the end and delighted all by busting the ghosts with their proton packs. This obviously affected the sales of the figures which were immediately reduced for clearance. Even to this day and they can still be bought rather cheaply. You can usually get a group of 5 figures loose and complete for as little as $10 on popular online auction sites. The 3 females (who had rooted hair) are a little harder to find. The vehicles and playset however are even more difficult than the females to find, but since there isn't a huge demand the prices are still lower then the more popular group of Ghostbuster toys. Today, if the toys are bought at all, it is by Real Ghostbuster fans who consider them a sort of distant cousin to the more beloved team. While Filmation may have won the battle for ownership of the name, they certainly lost the war in the marketplace. Having said that, the figures do have a certain charm and are worth picking up even if just to celebrate a unique time in history when Ghostbusters and Action Figure fans had 2 lines to choose from.